If you have Windows Server vNext Technical Preview installations that are expiring in a day or so, you’ll be pleased to know that Microsoft yesterday addressed this issue and released a patch (as promised). 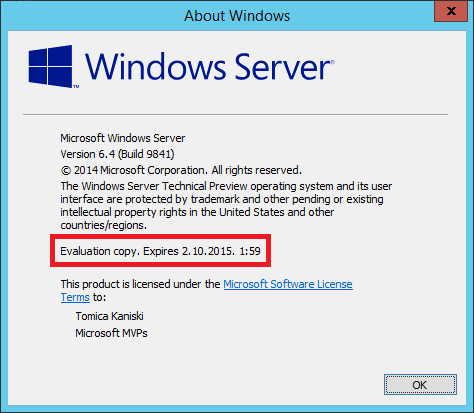 Patch will extend the evaluation period of those installations until the October, 2015. With the next build just around the corner, maybe you won’t need this patch to last for that long, but… it’s fixed. You can find the patch on Microsoft Download Center, and find the official announcement here. Just remember to read the install instructions coming with it. Some of us in the MVP community noticed (and finally resolved it, with support from Microsoft people) that the installation of this update on some machines (Hyper-V hosts, in my case) requires that you also (re)activate your Windows installation. If you don’t do it, it may seem that the patch wasn’t applied. Also, remember that this patch needs a reboot or two to be actually “installed”. My colleague Nirmal also blogged about, and even recorded the installation process, so check it out. Voilà… enjoy your “renewed” Technical Preview (1) machines! The new version of Windows Server is at an early stage of development, but some of the new functionalities for orchestrating virtual computer, storage and networking resources on commodity hardware is available for early adopters to test. Here’s how it’s shaping up!